Holy crap, your boy is tired. Besides the gym, I spent the day podcasting and working on the new site. Now, I was gonna start the new site from scratch, but I figure why turn my back on the fanbase built here, and have you guys go over to a new site. So, instead, tomorrow Fat Buff is going to get a big over-haul and become Geek’s Fit. I’m working with two very talented and close friends on this. One of which, named Matt, is gonna be helping with all the videos we do, going far and above whatever I tried to accomplish. The other is named Mike, and he’s going to be writing along with me. Talking about his workouts, creating workouts, and helping with the humor portion of the site as well. So, tomorrow will be the launch, and everything is going to build from there. Now today is gonna be a short update, because I’m tired, and let’s be honest, a bit lazy. I saw Straight Outta Compton, and it’s a damn good film. I grew up with gangsta rap, and loved NWA, especially Eazy-E, and Bone Thugs N Harmony. A few years later I got into Dre and the DeathRow Records scene. So, if you’re a fan of NWA, definitely see this film. Hell, so long as you like things are good, see this film. It’s insanely well made. Before we get to the action, I thought I’d tip you cats to some great documentaries about weight-lifting. If you guys dig watching things on that subject, then I’ve got some pretty good stuff for you. Pumping Iron – C’mon, everyone knows this, and if you don’t….then…well, let’s just say it’s shameful. Anyway, it’s the quintessential documentary about weight-lifting of all time, and was the starting point for the explosion of the fitness culture, not to mention the careers of Arnold and Lou. You can catch this on youtube, but you’re gonna wanna buy the DVD because there’s some great special features. Generation Iron – This is more current, and focuses on the top bodybuilders getting ready to topple Phil Heath at the 2012 Mr. Olympia. It’s a damn good documentary, and does a great job of showing the variety of characters on the stage. You can catch this on netflix. Stand Tall – This is a documentary done in the early 1990’s, and it follows Lou Ferrigno as he takes to the bodybuilding stage once again after a 15 year lay-off in order to become the first ever Masters Mr. Olympia. It also follows his chief competition, Boyer Coe, one of the most consistent bodybuilders of all time. A ton of great training footage, and you get to see the greats again. Awesome stuff. Again, youtube. Tune in on Saturday and I’ll give you hip cats the rest of my reckos, including an awesome doc on powerlifting, as well as some youtube fitness channel reckos. Before we get to the action, I wanted to go over a very important warm-up technique. It’s for the Rotator Cuffs, one of the most crucial parts of the body, that if you keep healthy, you can keep lifting with progress and vigor for all time. First off, let’s discuss the elephant in the room, clearly I should be doing computer graphics for Pixar, living in a mansion. However, I cannot deny you, the people of Fat Buff County. So, grab a light dumbbell, I’d say start with 5lbs. 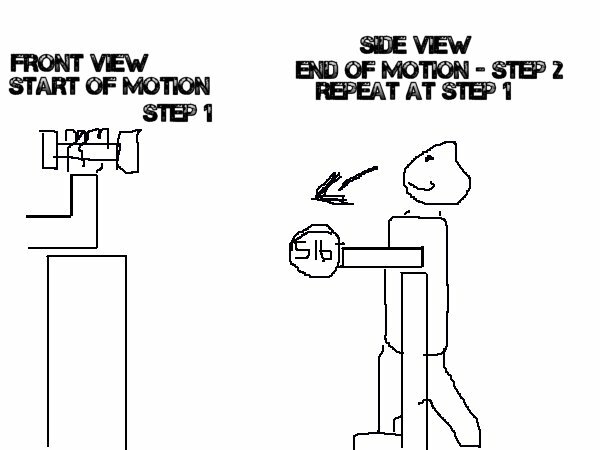 Angle up against a bench you set upright, and place your arm on the back of it at a 90 degree angle. Then you simply keep your arm locked, and lower the dumbbell, so that all that moves is your shoulder. Like a lever. It’s like if you were imitating an arm wrestling match, but your arms are at your side. Do two to three sets of around 8-10 reps. Don’t go near failure, because the rotator cuff is very delicate. Just warm that bad-boy up. Afterward, I usually do a few sets of light Lateral Raises, and OHP. I do this warm up on my Push Days, or any days I do chest or shoulders. Busy day for your boy today, so let’s just hop into it. 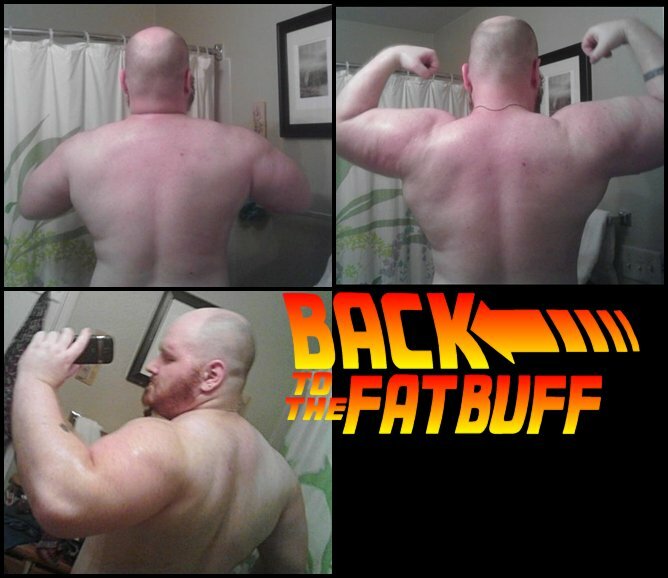 First though, I made a collection of pictures today that I took after my back workout. It’s really coming along, and I’m proud to say it’s probably my best feature. Here at Fat Buff INC, we always think 4th dimensionally. Also, I have no idea why it looks like I’m crying in that last picture. I was taking some update photos this morning of my back and thought I’d share them with you cats. The current one is the one on the right with the one on the left being from March. I’m pretty damn happy with the results. It’s only been about 4 months, but I’m wider, with thicker traps and spinal erectors. The back is my favorite body part to train, and something I never gave much focus to until about a year or so ago. OK, I got caught up again in a bunch of work today, so I have to punk out and just update with the workout. However, I promise that come Saturday I’ll not only write some more varied articles, but also get back with the videos. Hot damn. I pulled the photo on the left from my Instagram [@CaliberWinfield] and the one on the right is an old photo on my computer. It’s about 4 years old. Now, the reason it has that text on there is because it was a header I made for an article I wrote years and years ago. Anyway, it really blew my mind to see the difference, and also goes to show how you should take photos all the time. Even though it may seem egotistical, screw it. It’s great to look back and see all the progress you’ve made. My arms were about 17 in the old photo, and now they’re 20. Not too shabby.